In a nice piece of timing, the annual “Dreamtime at the `G” match between Essendon and Richmond took place in the week that Kevin Sheedy was inducted into the Australian Football Hall of Fame as a Legend of the Game. Sheedy’s contributions to these two clubs over 40 years are profound and the Dreamtime game was his brainchild. Staged annually since 2006, it is a legacy of his encouragement of Aboriginal talent in an era where it was often ignored or, worse, vilified. Sheedy’s idea has grown to the point where it is now the centrepiece of the Sir Doug Nicholls Indigenous Round. Yet as I sit in the darkened arena pre-game I find myself struggling with what I witness. Sheedy’s original good intention has survived and prospered, no doubt. But it’s done so in part through the AFL’s typically heavy-handed way of commercialising and institutionalising another “event” in the footy season. I see inherent contradiction around me. The Indigenous Round guernseys are a wonderfully eclectic mix of stories and symbolism created by local Indigenous artists and designers. But they’re also a lucrative merchandising opportunity. 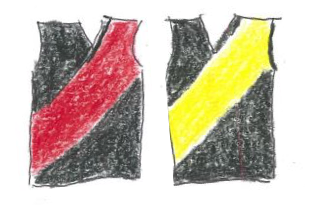 “Complete your set of 2018 team guernseys – regular strip, clash strip and Indigenous Round strip”. A snip at $120 each. The pre-match ceremony offers some excellent and unusual musical and dance performances, but their subtle authenticity is engulfed by flashing lights and tired renditions of Solid Rock and Treaty blasted through the PA system. It hardly inspires reflection about the contribution of Aboriginal footballers to the game, let alone any deeper understanding of Indigenous culture. It only makes sense when the ball is bounced. In the opening seconds, Anthony McDonald-Tipungwuti grabs the footy and launches a long-range shot that misses by inches. It is admittedly a breath-taking start to a much-anticipated contest that would get any crowd up and about. But there is a noticeable volume and unreserved warmth in the response. For those brief seconds, 81,000 of us are all willing it through. The contrast couldn’t be greater with the shameful booing of Adam Goodes that so recently blighted our game. Small steps, I guess. I always had a sense of “what might have been” about Sheedy. But for some sliding doors moments in the early 1980s, perhaps he could have been Richmond’s Great Coach. Instead, his 27-year reign at Essendon coincided with the very worst of Richmond’s lost years. As we desperately hired and fired coaches, plunging the club further into debt and ineptitude, Sheedy merrily reinvented Essendon. From a club with a reputation for pretty football but a soft underbelly, he made them hard, determined and smart and, as he did as a player, he extracted the maximum out of the talent he had available to him. 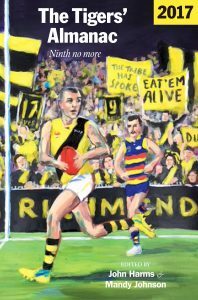 Richmond wins over the Bombers during this time were scarce – just 4 in 17 seasons between Sheedy’s first Premiership year, 1984 and his last in 2000. Even as the Bombers descended into their own recent hard times, the Tigers’ victories against them have been narrow, almost apologetic, rather than decisive. So it is that I regard Saturday’s Richmond’s 71 point demolition of a half-decent Essendon side with – a sense that a full circle has been completed. Both sides appear to have reverted to versions of themselves before Sheedy’s switch. The Tigers, once again tough and ruthless; the Bombers, spasmodically exciting but lacking resolve. From the winner’s perspective, there is little to report about a contest this one-sided without appearing to gloat. Suffice to say, Richmond is uncompromising from the outset, exemplified by a pile-driving gang tackle that ends David Zaharakis’s night. Having scored the first five goals of the game, the Tigers allow the Bombers a 20-minute period of ascendancy that briefly threatens to erode their lead. But a poor miss from Jake Stringer that could have reduced the deficit to seven points is pivotal. From the kick-in, Richmond go coast-to-coast and add two further goals before the break, extending its lead of 31 points. Richmond kills the game with a third quarter masterclass of all facets of what makes this side great, and its final quarter is a thoroughly controlled exercise in “going through the motions”. With the result virtually never in doubt, it is a pleasure to be able to appreciate the sublime skills of Yiooken Award winner, Shane Edwards, who fittingly chooses this occasion to produce one of his best games. It seems only yesterday that “Titch” aptly justified his nickname. In his early time at Richmond, the lightly-framed Edwards was so regularly rag-dolled and buffeted out of contests that I doubted he could survive at AFL level. His improvement over the years has been steady, constant and hugely under-appreciated. In last year’s Grand Final, he was a leading contender for the Norm Smith Medal. He possibly missed out only because some of his contributions were too deft and instantaneous for the judges to notice. It’s a rare privilege to be able to savour the abilities of a player whose quickness of foot is bettered by his quickness of hand and, even more, by his quickness of mind. He works the angles – brilliantly. In close he sees possibilities that others can’t – in an instant. Josh Caddy’s long running goal just before half-time is created by a deft little sideways soccer pass by Edwards that few players would think of, let alone execute so precisely. Coach Hardwick sums it up, saying that Edwards makes others around him better players. I would love to hear Kevin Sheedy’s opinion of “Titch”, because as I watch his game on Saturday, the inspiration for “Dreamtime” is there right in front of me. Oh for the reflective silence before any game, but especially the Indigenous Round games. I was glad that even with the thumping of the countdown to the bounce and similar anthems at the SCG, the solo didg seemed to prevail. Do you think we could mount a charge to have the AFL allow us a bit of quiet time again? Your portrait of Edwards is spot on. He is one of those opposition players this supporter loves to watch. Deft is the word, isn’t it? It has all the lightness and touch and precision and brevity of his execution. Thanks for the astute focus. The intersection of the Burgoyne and Edwards sets is increasing. Great write-up of the night, Stainless. To be fair to the AFL (did I really write this?) when Sheedy came up with the Dreamtime concept, it was as commercial as it was good-intentioned. It was always at least partially about making money for the two clubs involved. You are spot-on with your sliding doors comments. To this day, Sheedy is still the ONLY Essendon coach to win a final since the 1968 Preliminary Final, which will be 50 years ago in few months’ time. Sheedy is only one man but he is one man who was always going to be successful. I have no doubt that if he had gone to any other club, success would have followed him there instead of to Essendon. It is such a shame that this was not recognised at Richmond in 1981. Mathilde – greatly appreciate your comments, especially from such a deft wordsmith as yourself! I’ll happily join your petition to the AFL for a “Quiet Round”! JTH – I hadn’t really thought about the Edwards/Burgoyne comparison but I see where you’re coming from. I think when it comes to executing the basic skills with consistent precision I’d prefer Burgoyne, but both are amazing players who’ve improved with age. Joe – Sheeds was lucky in that he inherited a very talented group at Essendon in the early 80s that just needed toughening up. However he unquestionably proved his worth as a coach, with the ’84 and ’93 Flags particularly achieved through tactical nous as much as raw talent. Stainless, Titch has been a revelation. Got better each year. Despite the associated AFL approved hoopla, I really like the spirit Indigenous Round is played in. As someone who was not taught anything about our indigenous history at school, I appreciate it and learn something new every time. Cheers. Sheeds is a legend . His work with indigenous communities, especially the footballers, since the 1980’s has been marvellous. He and the AFL have been marvellous in tackling the racism that was long inherent in the game. Who remembers ‘Big Al’, from Collingwood? Re the commercialisation, merchandising of the game, that’s a reality. No matter if we like it/loathe it, deny it, the AFL is part of what we can deem the entertainment industry. I recall reading an article about premiere league back in the late 90’s when Manchester United’s takings from merchandising exceeded gate takings. It’s what it is, it’s more than a game: it’s big business. Joe interesting point re Sheedy being Essendon’s only coach to win a final in 50 years. Hird, Tuddenham, Knights, etc, not much to boast about .